Consistency has always been a key factor in Mallory Knox’s rise to success. From their debut EP Pilot in 2011 – comprising of the first songs the band had ever written – to their first full-length, 2013’s Signals, the quality of their releases has always been sky high. However, with second album Asymmetry, there could be enough to warrant some apprehensiveness, if only because the run-up is remarkably similar to how fellow Brit megastars Lower Than Atlantis were when they released their rather mediocre third album Changing Tune (although they’ve recently redeemed themselves with this year’s excellent self-titled effort). Since Signals, Mallory Knox have changed labels from A Wolf At Your Door to Sony imprint Search And Destroy, and are releasing their album in only the following year to their debut. Fortunately, Asymmetry doesn’t see them falling victim to the same problem, and instead sees them vaulting another few paces towards becoming Britain’s next conquerors. The first thing about Asymmetry is how huge it sounds. Signals sounded huge itself, but this time, it’s just on another level entirely. Whereas Lighthouse was Signals‘ big moment, that pales in comparison to some of the stuff that Asymmetry is packing. Shout At The Moon could be the dictionary definition on an anthem, while When Are We Waking Up?‘s lush orchestral backing adds an extra layer of scope to the already grand precedings, and the seven-and-a-half minute opus She Took Him To The Lake is by far the most epic gesture the band has ever undertaken. There’s no messing round here; it’s all hugely impressive stuff. In fact, at no point does Asymmetry ever stagger near to disappointment during its eleven tracks. Heart & Desire and staggering closer Dare You are already arena-worthy cuts, the latter especially with Mikey Chapman’s soaring vocals working at absolute full power, while the likes of Ghost In The Mirror and The Remedy pick up the pace with driving riffs and bulldozing choruses of the highest calibre. What is likely to be Asymmetry‘s main draw though, is its shameless mainstream appeal. Ghost In The Mirror and Shout At The Moon have already become staples on daytime Radio One and have introduced a whole new audience to the band, something that this full collection of songs should make a reality even more. The one problem about Asymmetry – and this is a really minor problem – is that, at points, it feels like it uses the formula of Signals a bit too much, and that some of the tracks could have been included on their debut. Having said that though, they more or less nailed it the first time around, so there’s really no reason they wouldn’t want to build on it further. And even with the obvious similarities, there’s nothing to prevent Asymmetry from being an absolutely great album. 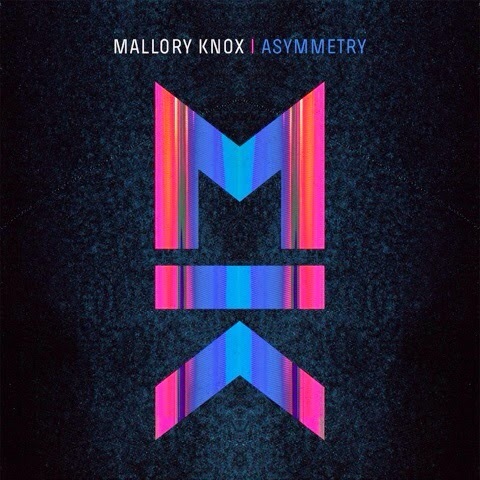 In an age where the music industry is determined by the latest flavour of the month, that Mallory Knox have gained the success they have with actual talent and an entirely fantastic album is a testament to how far they could go. It’s a phrase used all too often, but this could be the album that puts Mallory Knox at the forefront of British rock, and while it is often used, there’s no other band more worthwhile than them.